With Green Any Site, you can easily donate a portion of any online purchase to the environment. It’s free, there’s nothing to install, and it takes just a click each time you buy something. Here’s how it works: Online retailers pay other sites a percentage of each purchase for referrals. When you use GAS, we make sure all of that money goes to supporting green causes, instead of ending up in somebody else’s pocket. Go green when shopping online! Shopping on the Internet is convenient, easy, and often cheaper than visiting a retail store-but there’s still a significant environmental impact. Whatever you buy has to be manufactured, packaged, and shipped, creating waste and pollution with each step. Then the next time you’re shopping online, before you add something to your shopping cart, click on the bookmark… And voilà: you’ve just done something great for the planet. You never pay an extra cent. All it takes is a quick click, and we’ll automatically donate a portion of your purchase to the Green cause our users chose that month. Getting Started - Using GAS and making a difference How Does It Work? or... Where does the money come from? 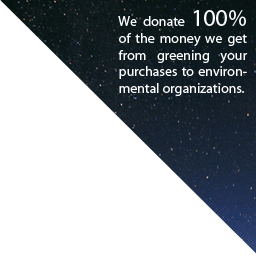 Each month we donate 100% of our income from greening your purchases to a different green organization. We currently support Conservation International, named among the “10 Best Charities Everyone's Heard Of” by Charity Navigatior. Founded in 1987, Conservation International aims to protect life on Earth and to demonstrate that human societies will thrive when in balance with nature. How will clicking a button help the environment? Do I have to pay anything extra when shopping? Don't you have to sign an agreement with every single store online for this to work?